Below is a brief history of Cooper Pest Solutions through the decades. 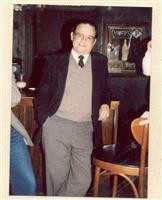 Ted Cooper began building his business “one client at a time” in the 1950’s. In November of 1955 Ted’s friend, Kal Azarki, shared some of his painting company’s space with Mr. Cooper as he was launching a business of his own. Within the same month, Cooper Pest Control Inc. was incorporated in the state of New Jersey. Around 1957, Ted’s mother, Blanche, made the middle room of her 6 Glenwood home and started helping her son by becoming his secretary. In 1962, Ted, and his wife Sybil, purchased 6 Glenwood from Ted’s parents and moved in with their three month old son, Phillip. Ted then leased space in Trenton for office work to make room for baby Phillip in the middle room. Two years later Ted moved the company to 868 South Broad Street in Trenton where it remained for the next decade. The building was part of a row structure sitting next to a police station with a small back lot leading off to an alley way. Despite being located next to a police station, the company ended up in the middle of riots in the late 60s and early 70s. When Ted’s mother Blanche passed away in 1965 Sybil did her best to fill her mother-in-law’s shoes as secretary while looking after her infant son Rick and three year old Phil. Regrettably, the company was subject to three robberies between 1966 and 1970 prompting Ted and Sybil to look for a place to relocate the company. In 1970, the couple purchased 351 Lawrence Station Road in Lawrenceville NJ and moved their business away from, but still close to Trenton. After two years in the new location, Ted installed an underground gas tank in an effort to create efficiencies and purchase cheaper fuel during the gas crisis. In 1973, the Burrough’s Automated Accounting System was purchased. The machine was an automated way of handling accounts receivables based on cards with magnetic strips for every client. As the company moved forward with accounts receivables, it also moved forward with new cars as Ted predicted a second gas crisis. With his gas tank in the ground, he began switching from red trucks to new gas efficient green and white Toyota Corollas. As the vehicles changed, the logo on them altered as well. The now famous Cooper logo hit the scene in 1976. Don Fraunfelker, who painted the Cooper cars, worked with Ted & Sybil to design the new logo containing eyes within the name. In 1976, Ted and Sybil’s oldest son Phil, turned 16, got his license, and started his first route which he continued for two months until school started up again. In the same year, Ted was president of the New Jersey Pest Control Association and was named Pest Control Operator of the Year. By 1978, the Coopers were onto their next big project. Ted, Sybil, and their friend Stanley Saltzman, owner of ChemTec Pest Control of Saddle Brook, NJ formed a new company, info pest, to sell software for the pest control industry. Basic Four was selected as the hardware and Frank Coll was hired to write the software code. Cooper Pest was one of the first companies in America to computerize its routing, accounts receivables and general ledger. 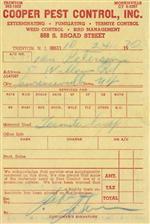 The year 1980 brought about one of the most revolutionary changes the company ever made – off-cycle billing. The concept was to separate billing from the delivery of service in residential markets. Before this change, “skips”, (when a customer doesn’t accept all of their services during the year and getting out of being billed the full annual value, were very common). With Teds new system, homeowners purchased a service plan that eliminated the possibility of “skips”. In the same year, Phil left the company for college at Wittenberg University before transferring to George Washington University, as Rick entered the company with his first route at the age of 18. Another big decision was made in 1982 as a controversy arose in the termite industry. The industry that once brought in 25% of the company's annual sales became the target of a lawsuit. After some serious thought, Ted decided it was best to leave the termites in the past and move on to new things. With termites going out the door, Phil came back in as a full-time commercial sales rep two weeks after graduating from George Washington University. In 1984, Cooper “Green” was then formally introduced and used to paint all of the Cooper cars which then turned into Cooper trucks with red caps. Not long after this, Rick graduated from the University of Delaware with an undergraduate degree in entomology in 1986 and entered the company as a technician. Two years later, Rick went back to school for his Master’s Degree at Rutgers University. Phil’s next big step was becoming a licensed public health official bridging the gap between pest control and the regulatory community from a health perspective. To wrap up the 80’s, Cooper introduced Wasp Prevention as a service in 1989. 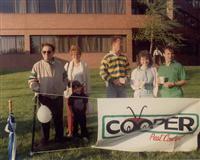 In December of 1990, Phil was named President of Cooper Pest Control. With his son taking on more responsibility, Ted Cooper began stepping back and taking more personal time as he took on the less strenuous role of CEO. As his father was stepping back and brother stepping up, Rick graduated from Rutgers with a Masters Degree in Entomology and began rebuilding Cooper’s technician staff as Vice President of Technical Services. While rebuilding the staff, four key individuals were hired: Dave Burgess, Ray Navarro, Tom Waterbor, and Dave Walters. Each of these individuals worked closely with Phil & Rick shaping the company over the years. Dave Burgess eventually became General Manager, and Ray Navarro became Rick’s top technical specialist. Rick continued to bring about positive change with his return by introducing cockroach baiting to Cooper. At this time, cockroach baits were obtainable but not used by the industry. While earning his Masters at Rutgers, his research concentrated on German Cockroaches. He then used that research on cockroach nutrition and development to cultivate a Cockroach Baiting system for Cooper. The company continued advancements in the roach industry two years later by acquiring Roach Proofing, which resulted in 40 long-term health care facilities for Cooper. While developing the Roach industry for Cooper, Rick also enhanced the companies Yellow Jacket Traps leading to new Yellow Jacket Trapping programs. As if the young Cooper wasn’t already bringing enough to the company, he began forming a relationship with the New Jersey Environmental Federation. Rick attended his first NJEF annual conference where he met Jane Nogaki, who would later work on a number of important environmental initiatives shaping New Jersey pest control with Phil. At the time, Rick didn’t know he would later speak at several NJEF annual conferences. While his younger brother was bringing roaches and yellow jackets to the company, Phil was working on what would also become a very long relationship with the MS Society. His first City to Shore ride was in 1993. Four years after his return to the company Rick Cooper served on the Governor’s IPM task force in the state of New Jersey. Tragically, just three years after celebrating 40 years of success in the business he built from the ground up, Ted Cooper suffered a stroke and passed away at the age of 69 in 1998. Once again, things in the company were changing. Cooper left custom software, moved on to Pest Pac software, and named Nancy Kintner Director of IT Services. While all was happening at Cooper’s home base, Rick’s speaking career was taking root beyond the Northeast. He was invited to speak at the Purdue Pest Control Conference (one of the well-respected conferences in the industry), the University of California, and Maryland University. When the new millennium hit, Rick was named to the 2001 Leadership Class from PCT Magazine, and asked to edit the chapter on bed bugs in the 9th edition of one of the industry’s most well respected text book reference, “The Mallis Handbook of Pest Control.” By January of 2002, Cooper officially re-entered the Termite industry, and Rick developed the first Carpenter Ant program in the country where treatment is exclusively from outside the building using insect baits. One year later, Cooper Pest Control was named as one of PCT’s Top 100 Pest Control Companies in the United States and exceeded 3 million in annual sales. In the same year, Rick was featured in a New York Times article about his Carpenter Ant baiting. He also served on the NPMA Quality Pro committee to develop a good housekeeping seal for the Pest Control industry. 2004 brought about big changes for the company. The name was changed from Cooper Pest Control to Cooper Pest Solutions as the company moved into the brand new headquarters connected to the back of the previous building. July 15th of that year was not only the grand opening of the new building, but also the release date of Phil Cooper’s customer service book “WHAT + HOW = WOW.” Since 2004, the company has continued to grow in numbers and successes. The past decade has seemingly revolved around the comeback of bed bugs. Rick’s concentration quickly turned to bed bugs, and he became a nationally recognized expert on them. He was featured as an expert on the “Early Show,” “Dateline,” NBC’s “Today Show”, and New York Mayor, Michael Bloomberg, appointed him to the NYC Bed Bug Advisory Board. With all the bed bug commotion happening, Phil took notice to the amount of false information provided on the topic. With this in mind, he created BedBug Central with his nationally recognized brother providing his knowledge as Vice President in 2007. BedBug Central is now one of the leading bed bug websites and providers of bed bug information, education and products in the country. In 2010, BedBug Central launched the world’s largest bed bug education meeting and trade show, BedBug University’s North American Summit, held in Chicago. The North American Summit is now an annual event attended by governmental agencies, housing authorities, property managers, pest management professionals, and a variety of private sector industries. BedBug Central also includes a web series titled Bed Bug TV, which is hosted by Technical Director of BedBug Central, and research entomologist, Jeffrey White. As BedBug Central took off, Cooper Pest Solutions continued to prosper. In 2010 the company was honored by Inc. Magazine as one of the 40 top Small Businesses to Work for in the United States and in 2011 was awarded the Rothman Institute’s New Jersey Family Business of the Year. The success of the two companies did not go unnoticed as CEO Phil Cooper was recognized as the Corporate Citizen of the Year in 2013. The next year not only Phil, but the entire Cooper Pest Solutions Staff, was recognized by NJBIZ as the 2014 NJ Biz Business of the Year. Cooper is a family based business that thrives on team work and an exceptional knowledge base. The company has flourished over the last 60 years and will continue to do so for many years to come.